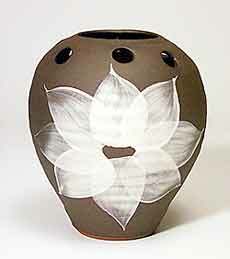 Dunster flower holder - 4¾" (120 mm) high. The Fishley Holland story starts with George Fishley, father of Edmund and Robert Fishley and grandfather of Edwin Beer Fishley (1832-1912, who ran the Fremington Pottery in North Devon from 1865 to 1906. Edwin's grandson, William Fishley Holland worked at the pottery from 1902, and found himself unemployed when his uncles sold the works after Edwin's death. William went to nearby Braunton and built and managed the Braunton Pottery for a gentleman by the name of Hooper. It was at Braunton that Michael Cardew learnt to throw, under the tuition of William Fishley Holland. In 1921 Hooper became insolvent and the Pottery was sold. William moved to Clevedon in North Somerset, purchased a piece of land and opened his own pottery. Many other Fishley Hollands followed, including William (his son), Peter, Isabel and George, who added 'DUNSTER' to his signature from 1959 onwards when he moved from Clevedon to Dunster, also in Somerset.